His questions (and Jan’s answers) about how ShipMonk did sales and marketing caused me to prick up my ears. Jan the founder – started talking about SEO (search engine optimization), describing how important content marketing was for his niche B2B business. He said most of it was done by someone in house called Augie. whose job, amongst other things, was to get content about ShipMonk into relevant places on the internet. I’ve long felt by gut feel and instant that for highly specialised services this must be a good strategy. Here was a successful startup following exactly the strategy I felt should work well. Jan went on to describe what might be called “long tail SEO” where the goal is to make sure that when a target client is searching for detailed information about a problem related to the industry the vendor is in, they will find content from the vendor that will build both awareness of, and confidence in, that vendor, possibly with a link back to the the vendor’s web page. I thought to myself , if I can get to this guy Augie – I can find out if I am right, and share that with my podcast listeners. I noted his name, (made easy by Mixergy as they have a transcript of their interviews on the website) and googled it, together with the name of the company and Twitter, Linkedin. Within a few seconds I had attempted to connect to Augie by Linkedin and Twitter. (In my experience I can usually reach about half the people I want to get to this way). I don’t expect success ever time – but it is quite easy most of the time. There were three reasons why I wanted to talk to him. 1 As I wrote above he was doing what I think that many companies with a well defined product should do, following the Gary Vaynerchuk model of being helpful, providing Value first and only later potentially asking for something in return. I like wanted to find out and share and tricks of tips in how to do it. I wasn’t expecting was how open, intelligent and good humoured Augie was going to be . The brand of a company is very much reflected by the type of people it attracts and retains. ShipMonk is doing a good job. So what does actually Augie do to boost B2B specialist sales lead generation and marketing? Augie does a number of things that are common sense and good practice in for business. He hangs out on line whether the customers are and is helpful and friendly. ShipMonk offers 3rd Party logistics and order fulfilment for on line shops, andsuccessful Crowdfunding campaigns where there is a logistic task – sending out products to all those who supported the project once they are produced. He spends a lot of time on Quora, a global English language “Question and Answer” Portal. 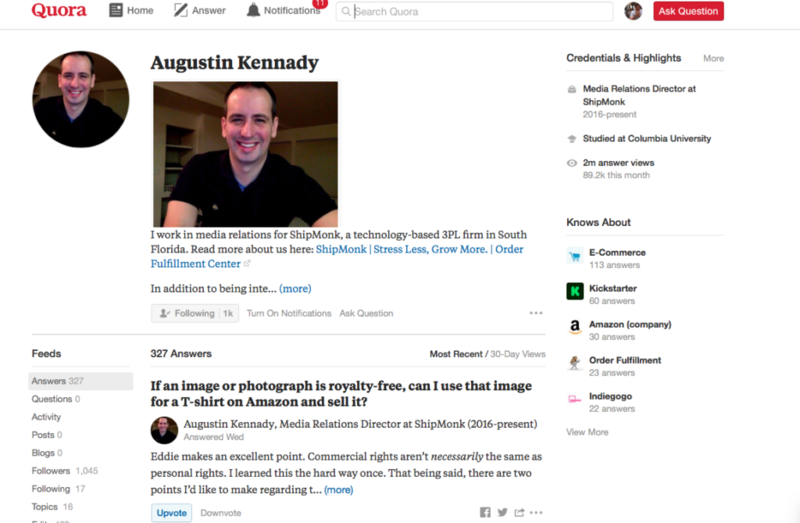 Quora – allows users to add their credentials, a link back to your company and job position, but he doesn’t end his posts with “use ShipMonk services”. He posts intelligent thoughtful answers and is a top “Quora” answerer, which means that when people posting questions to do with e-fulfilment on Quora his name pops up as a person they can request an answer from, positioning him and ShipMonk as experts and helpful people. This isn’t the only place however, there are popular software services for on line shops like Shopify and others, and he is active in their forums as well. so he spends time in Shopify, Magent0, Woocommerce (a WordPress plugin focussing on e-commerce), and Reddit. If your curious – is Shopify good? Then do some research and you might find it’s the platform for you. If you’re looking to unlock the potential of your Magento powered site, including the implementation of commercially viable keywords and optimized product pages, magento seo services are definitely worth consideration if you’re ready to bring big revenue to your ecommerce operation. At the front of his mind is the need to focus on being helpful to prospective clients, believing that “being helpful” rather than “self promotion” is much more effective in encouraging people to check out what they do. When he does post a link he adds a UTM Code Generator in the link which means that he knows which traffic comes from where. When I asked about Linkedin and Facebook groups – he commented that, although these platforms are huge and shouldn’t be ignored, they are so dominated by users promoting their services that this commercial marketing sales-y noise drowns out the more positive impression that exists in on line communities that run for the benefits of their users rather than sales people. The second thing his does is guest posts on blogs that are possibly or of interest to his potential clients. The content of the blog posts are to position Augie and ShipMonk as experts and professionals rather than just be self promotion. To decide which blogs are worth writing for Augie checks, how active they are. If the last post was in 2016 or earlier, the chances are it is dead. Also he spends some time reviewing the blog checking that it is ‘real’ and of reasonable quality content. A blog full of get rich quick schemes, dietary supplement ads, celebrity scandals and so on, is not worth developing a relationship with. As in Peter Theil’s Palantir , a smart human together with high quality tools, works better than people or techhnology alone. Gary Vaynerchuk of Vayner Media and the “Ask Gary Vee” show often advises entrepreneurs to check out both popular Pinterest and Instagram influencers in their locality. While really big names charge a lot, he thinks that the local “star” with a few hundred or thousands of followers may be very glad to talk about local businesses that have the right chemistry for them. A third way that Augie works on to get the word out about ShipMonk is through co-operation with third party sites that provide experts to journalists. The one he talked about was “Help a reporter Out” https://www.helpareporter.com the idea here is that rather than send press releases to journalists who are usually not interested in the content, he commits ShipMonk to being available when journalists are looking for someone to comment on a news story. This approach works very well. It’s important to note that from time to time journalists prefer to access to the CEO or Founders rather than him, so top management have to be on board and supportive. ShipMonk also runs paid Facebook and Linkedin adverts, but this is not Augie’s responsibility. What they find is that more than half, possibly 2/3 of leads that convert into sales come from his activities. A key question is to compare the cost of acquisition from this “useful content for our target market “approach to traditional on line advertising and also look at the life time value and unit economics. It’s important to note that Shipmonk expect to make significant profit per customer, so it’s well worth investing time to generate such leads and clients. This isn’t always the case with lower value added sales. There is possibly an upper limit to how much can be done, both in terms of content created, and finding places to put them. 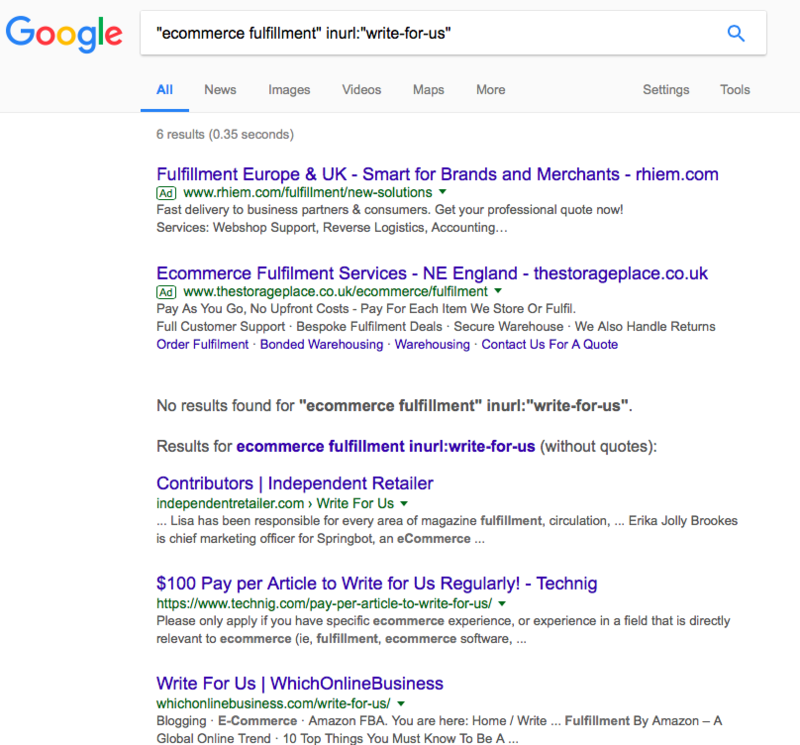 We reviewed in the podcast However, the numbers that Augie gives suggests that especially for a start up with limited funds this is a better way to go than throwing money into Adwords. It may be hard to scale up, even if the cost per lead is less. We discussed using external writers to create content. In his experience this sometimes worked but the challenge is exactly the same as I have had with my businesses in Poland. that finding people who can write well and are able to sound authoritative out the sectors we are active in is not easy. A good professional writers in the US typically charges between $120-200 for a 600-800 so in the range 2-4 cents a word. In terms of future developments, Augie is convinced that ShipMonk should start putting out content on Youtube. “How to” videos are extremely popular and that his boss Jan will be listening to the podcast..… so watch this space. I suggested they consider webinars and using webinar content for videos as well, and I’d love to know if this works as well. Augie’s view was that, overall, this type of marketing is is a long game. It doesn’t lead to over night success but certainly is more cost effective in sales generation that Facebook and Google Adwords alone. long tail relevant content creation. You recognise that this may not scale in the sense that you cannot market in this way alone, but you are sure that this if done well, can do a lot for your business. 1. Make sure you should know the sort of problems that your business solves for potential and existing clients. 2. Make a long list of places where your potential clients will end up checking when they go hunting for solutions to the problems you can solve. This list should include off line as well as on line sources of information and advice. Most “off line” events like conferences and consulting companies have a lot of on line promotion too. 3. If there are consultants, training companies, trade associations and events where executives go to ask questions, find answers and new ideas, note them too. Start answering questions on Quora, Build up some credibility on Quora. Use the Searches recommended above to find blogs that could carry guest posts. Write your own blog posts, and consider other forms of content. Consider Webinars about the problems your products solves. Put webinars and presentations onto Youtube and Slideshare. Experiment with platforms like Pinterest, Tumblr, Twitter, Instagram and Snapchat, even if you think that Linkedin and Facebook is where all the action is. Track what works and what doesn’t. Develop marketing automation programmes so that you don’t let the people who you attract into your sales funnel die away, instead develop “lead nuturing” techniques to keep them warm. SEO is a very long-term game, but it does give a high reward for those who are consistent and patient. And like you said, doing guest-blogging is so important for off-page SEO. Great interview with a very experienced entrepreneur.